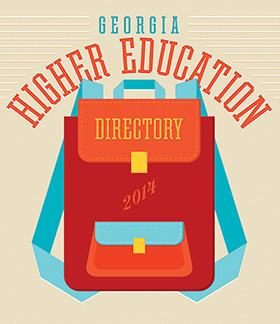 Georgia Trend's annual listing of the state's colleges, universities and technical schools, with information on admissions, costs and courses of study. Georgia’s collection of higher education institutions runs the gamut, from the 31 public colleges of the University System of Georgia (USG) that serve 309,000 students and the 23-school Technical College System of Georgia (TCSG) that serves more than 150,000 students to the private and for-profit schools scattered throughout the state. For the third year in a row, tuition at the majority of USG schools is set to increase by 2.5 percent, while TCSG increased tuition to $89 per credit hour. Mergers have been the dominate theme in past years, however, 2014 saw only two colleges combine: Okefenokee Technical College and Altamaha Technical College became Coastal Pines Technical College in July. On the horizon, Southern Polytechnic State University is set to merge with Kennesaw State University in Cobb County in January 2015, pending USG approval, and Southwest Georgia Technical College will merge with Moultrie Technical College next July. Education officials project that by 2020 more than 60 percent of jobs in Georgia will require a certificate or degree – up from 42 percent today. Coupled with the TCSG’s internationally acclaimed Quick Start program, which partners with incoming industry to provide customized training, Georgia’s higher education institutions can expect to see more students walking their halls in the future. Click here to see the to see our 2014 Higher Education Directory.